The new expansion pack of The Witcher 3 Wild Hunt – Blood and Wine features many new powerful weapons and armor sets and Aerondight Sword is one of the best and powerful sword there is in Blood and Wine with amazing damage output. It is a silver sword that definitely rewards a skillful swordsmanship. 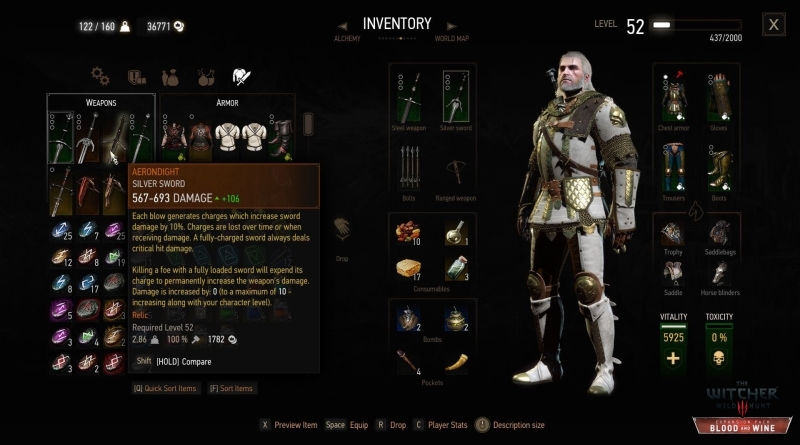 In The Witcher 3 Blood and Wine Aerondight Sword guide you will learn how you can get Aerondight Sword, its stats and how does this sword looks like in Geralt hands. If you have played previous games you may be familiar with this Aerondight Sword. In the first Witcher game, you will remember this sword as a Lady of the Lake gave it to you. And this time in Blood and Wine she will give you this sword but first you will have to prove your worth. In The Witcher 3 Blood and Wine, to get Aerondight Sword you need to complete specific vague quest. The particular quest that yo need to complete is called ‘There Can Be Only One’, it’s a side quest. You can pick this from a message board that we have found in front of Cockatrice Inn. This quest will lead you directly to Lac Celavy lake which is in east from the Corvo Bianco. You need to talk to the hermit who lives there, and he will tell you that you will get Aerondight Sword from the lake but first you need to prove that you posses 5 virtues. To prove 5 virtues you will be taking part in five different quests and you have to complete these quests with particular outcomes. Chose right and you will get Aerondight Sword. If you can import the previous two game’s save files which had this sword, you will just only need to fight Hermit. Search a notice board in Beauclair to start a quest called Till Death Do You Part. Then go to the cemetery and investigate, solve a dispute between 2 ghosts. You can solve this dispute any way you want. After this go to Clever Clogs tavern and talk to the quest giver and tell him that it was ‘Actually, just a marital spat‘. Alternative way: In the quest called The Warble of a Smitten Knight, finish a horse race and accept the duel and win this duel. Alternative way: Lift a curse off the Wight in a quest called ‘La Cage Au Fou’. Pick up a quest called ‘Big Game Hunter’ from a notice board which is in front of Cockatrice Inn. Do not harm any panthers while you are working through this quest. After the work is complete and you are back at the camp, then ask a guard about Count’s life ‘New life? Something wrong before?‘. Agree to visit his exhibition when he invites you ‘Sure, why not?‘. After that just do not forget to actually visit the exhibition and talk to that guard. Alternative way: Spare Shaelmaar after the fight in arena during a quest called ‘The Beast of Toussaint’. After you reach Beauclair, on the street a child will approach you with a letter from Yennefer. A letter that starts a quest called ‘Turn to Face The Strange’. Don’t be mean, leave a child some tip ‘Here, your tip‘. Go to a cave that is located bit north-west of Beauclair Palace. You will find knight outside who will ask for help. You will get a quest called ‘Feet As Cold As Ice’ if you accept. Go through the quest and when the knight starts talking to you, tell him ‘Take the damned head, go back to Beauclair‘. Alternative way: In a quest called ‘The Warble of a Smitten Knight’, win tourney after you are back from the woods. Aerondight sword is a silver sword with great damage, but it does not have usual stats. Instead, it has unique abilities. Every time you hit your enemy or opponent, your damage will increase by 10%. As time passes, you will lose charges. And same goes for getting a hit. When Aerondight sword is fully charged, it will deal critical damage with each and every swing. The other ability of Aerondight sword is that its damage will increase permanently every time you kill your enemy while the sword is fully charged. The threshold of this ability to increase is connected with your character level, which means this weapon practically level up alongside Geralt. Watch this below video to get the Aerondight Sword in The Witcher 3 Blood and Wine. The video is created by GosuNoob, I hope you guys will enjoy it!